This is “Price Discrimination: The Robinson-Patman Act”, section 28.4 from the book The Legal Environment and Foundations of Business Law (v. 1.0). For details on it (including licensing), click here. Now consider the situation in California, Oregon, and Wisconsin. 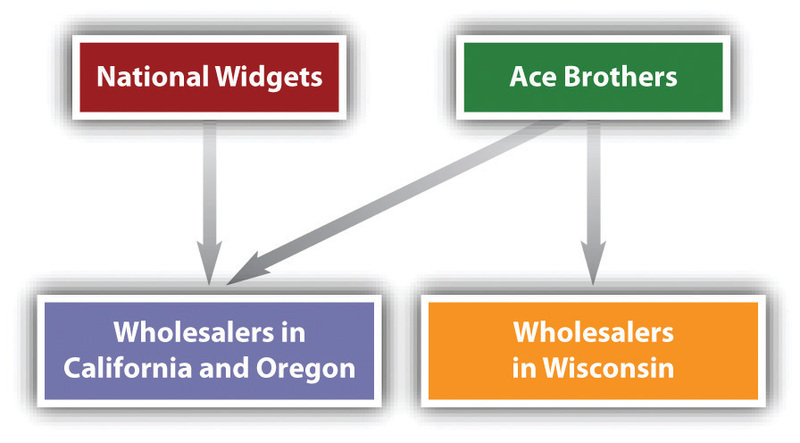 The competing manufacturers, Ace Brothers and National Widgets, both sell to wholesalers in California and Oregon, but only Ace has a sales arm in Wisconsin. Seeing an opportunity, Ace drops its prices to wholesalers in California and Oregon and raises them in Wisconsin, putting National at a competitive disadvantage. This situation, illustrated in Figure 28.2 "Primary-Line Injury", is an example of primary-line injuryPrice discrimination under the Robinson-Patman Act that directly injures a competitor, in violation of Section 2(a).—the injury is done directly to a competitor of the company that differentiates its prices. This is price discrimination, and it is prohibited under Section 2(a). Next, we consider injury done to competing buyers. Suppose that Ace Brothers favors Jobbers—or that Jobbers, a powerful and giant wholesaler, induces Ace to act favorably by threatening not to carry Ace’s line of widgets otherwise. Although Ace continues to supply both Jobbers and Widget Pushers, it cuts its prices to Jobbers. As a result, Jobbers can charge its retail customers lower prices than can Pushers, so that Pushers’s business begins to slack off. This is secondary-line injuryPrice discrimination under the Robinson-Patman act that injures a competitor of a buyer, in violation of Section 2(a). at the buyer’s level. Jobbers and Pushers are in direct competition, and by impairing Pushers’s ability to compete, the requisite injury has been committed. This situation is illustrated in Figure 28.3 "Secondary-Line Injury". Variations on this secondary-line injury are possible. 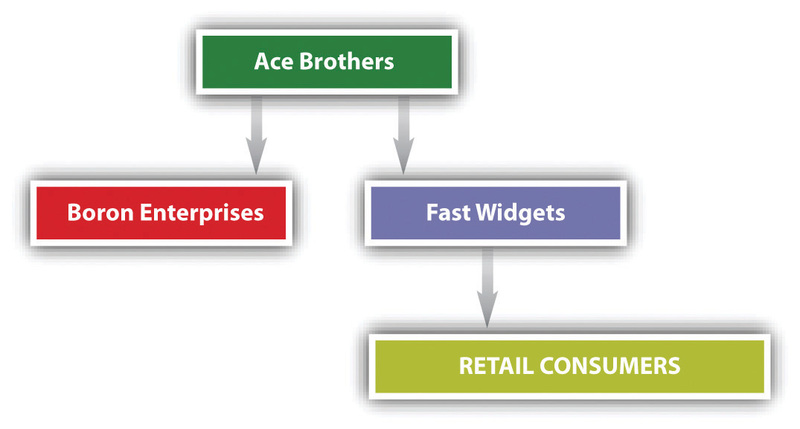 Assume Ace Brothers sells directly to Fast Widgets, a retail shop, and also to Jobbers. 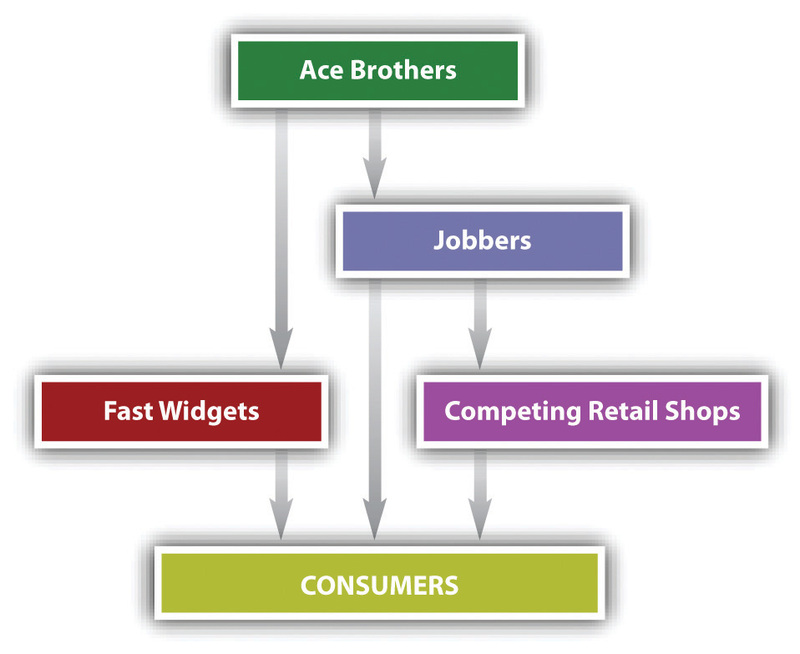 Jobbers sells to retail shops that compete with Fast Widgets and also directly to consumers. The situation is illustrated in Figure 28.4 "Variation on Secondary-Line Injury"). If Ace favors Jobbers by cutting its prices, discriminating against Fast Widgets, the transaction is unlawful, even though Jobbers and Fast Widgets do not compete for sales to other retailers. Their competition for the business of ultimate consumers is sufficient to establish the illegality of the discrimination. A variation on this situation was at issue in the first important case to test Section 2(a) as it affects buyers. Morton Salt sold to both wholesalers and retailers, offering quantity discounts. Its pricing policy was structured to give large buyers great savings, computed on a yearly total, not on shipments made at any one time. Only five retail chains could take advantage of the higher discounts, and as a result, these chains could sell salt to grocery shoppers at a price below that at which the chains’ retail competitors could buy it from their wholesalers. See Figure 28.5 "Variation: Morton Salt Co." for a schematic illustration. In this case, FTC v. Morton Salt Co., the Supreme Court for the first time declared that the impact of the discrimination does not have to be actual; it is enough if there is a “reasonable possibility” of competitive injury.FTC v. Morton Salt Co., 334 U.S. 37 (1948). 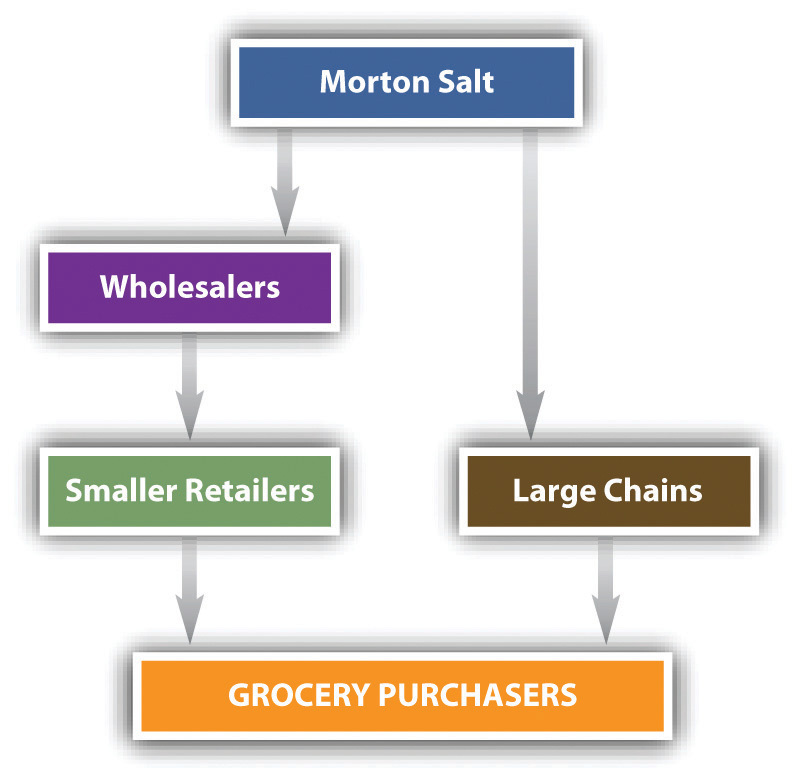 Figure 28.5 Variation: Morton Salt Co. In order to make out a case of secondary-line injury, it is necessary to show that the buyers purchasing at different prices are in fact competitors. Suppose that Ace Brothers sells to Fast Widgets, the retailer, and also to Boron Enterprises, a manufacturer that incorporates widgets in most of its products. Boron does not compete against Fast Widgets, and therefore Ace Brothers may charge different prices to Boron and Fast without fearing Robinson-Patman repercussions. Figure 28.6 "Variation: Boron-Fast Schematic" shows the Boron-Fast schematic. Second-line injury to buyers does not exhaust the possibilities. Robinson-Patman also works against so-called third-line or tertiary-line injury. At stake here is injury another rung down the chain of distribution. 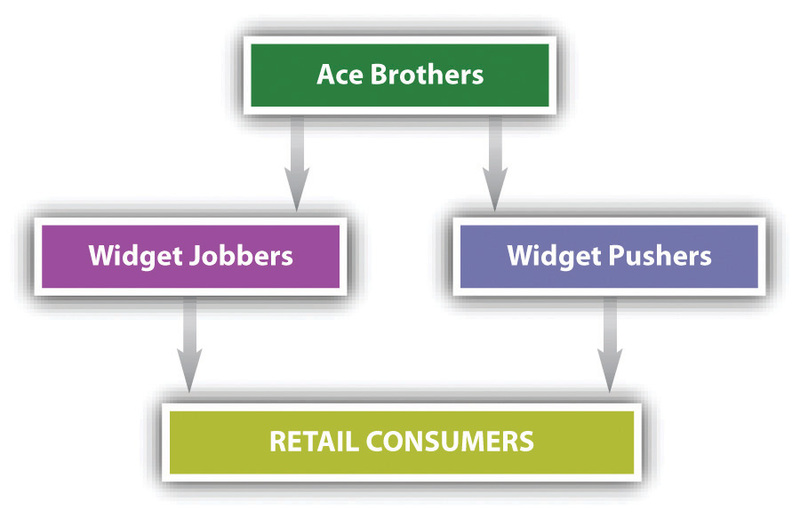 Ace Brothers sells to Pushers, which processes unfinished widgets in its own factory and sells them in turn directly to retail customers. Ace also sells to Jobbers, a wholesaler without processing facilities. 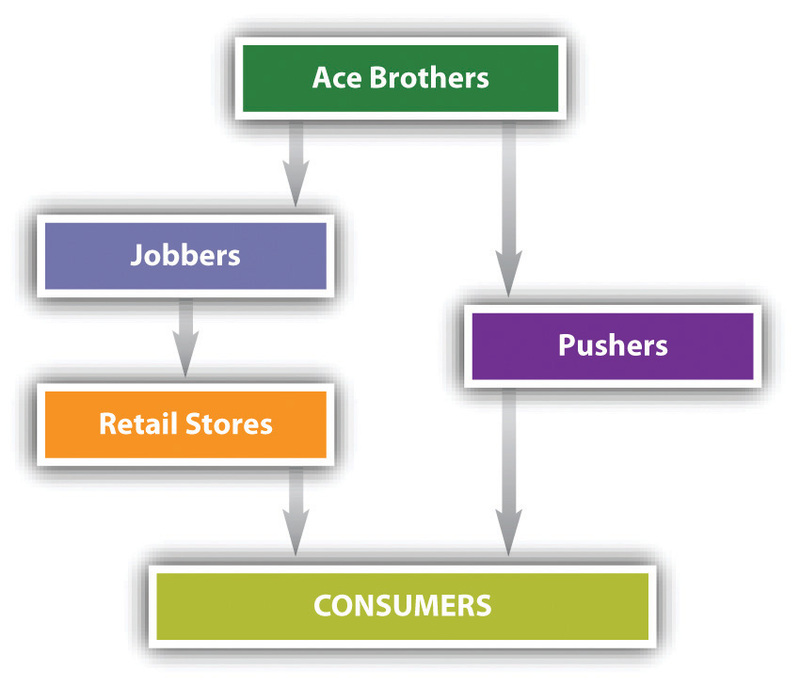 Jobbers sells to retail shops that can process the goods and sell directly to consumers, thus competing with Pushers for the retail business. This distribution chain is shown schematically in Figure 28.7 "Third-Line Injury".